Enjoy the waterfront views without the waterfront price tag! 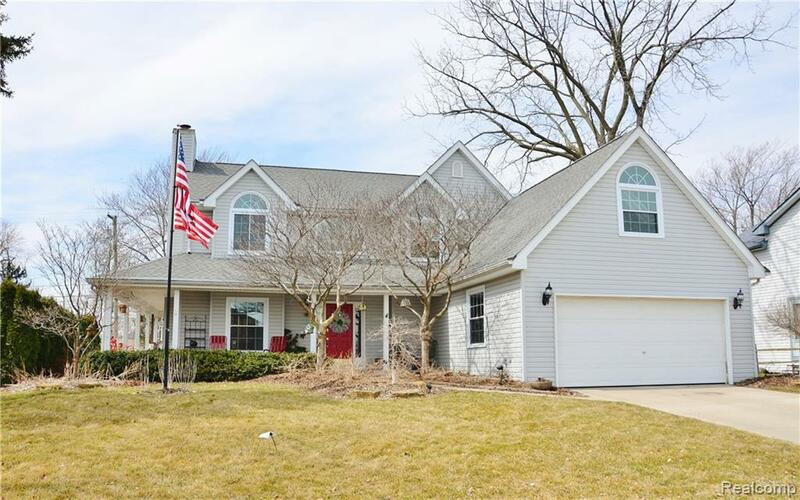 This lovely and well maintained home has curb appeal for days. Enjoy your view and your beautifully manicured yard with morning coffee on the wrap around porch. Large living room flows into the formal dining room and bright, cheerful (updated) kitchen. Upstairs; En suite Master Bedroom with cathedral ceiling, two walk-in closets, full bath with soaking tub and stand up shower. Two additional bedrooms, full bath with trey ceiling, and a 23x12 bonus room with cathedral ceiling. Beautiful views of the Detroit River from almost every room. Updates include; new windows, freshly painted, hardwood flooring in 2014, furnace and A/C 2012, roof 2007, kitchen appliances (3 years old), 6' of extra insulation. 2 car attached garage, fully fenced yard. BEAUTIFULLY landscaped with perennials that will be popping up soon! This is one sweet home!